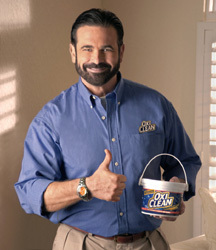 Yesterday brought the news that legendary TV pitchman Billy Mays passed away at the age of 50. My condolences to his family and friends. Most of us know Billy from his commercials and the booming voice he used to sell products such as OxyClean, Mighty Putty, and Orange Glo. His formula was always the same: loud voice, blue shirt, big smile. And it worked. Billy became one of the most sought-after pitchmen in the country and has made a hit out of countless products. Ever since studying the direct response business in college, I have always been fascinated by the art of the “pitch” and have immense respect for Billy Mays and the empire he built for himself. As a tribute, I put together a few things we can all learn from him. Here are the 5 Lessons I Learned from Billy Mays. Billy Mays understood the importance of WOW! moments. Talking about customer benefits and product attributes are important, but what really intrigues people is the WOW! moment. On his show Pitchmen, we saw WOW! moments like a power saw cutting an entire car in half or Billy holding a skunk to demonstrate an odor-killing product. This is what captures attention and demonstrates a product benefit better than words ever could. Make sure to add WOW! moments to your product demo or presentation. This is what people will be talking about afterwards. 3. Develop a Personal Brand. Billy Mays wasn’t only a man, he was a brand. By aligning themselves with Brand Billy, companies knew they could sell a lot of product. And it is this valuable brand that earned Billy Mays his fortune. As people continue to jump jobs more often, and start their own businesses, the importance of developing a personal brand continues to grow. A respected personal brand will get you more clients, or increase your worth when looking for a job. People buy things from people they like. Billy was always smiling. He was friendly and personable. He dripped with charisma. He seemed like a nice guy and people responded to it. Smiling is a key element of selling. Sales coaches even recommend you smile when you are on the phone as it improves the tone of your voice. Billy Mays understood the importance of being likeable and so should we. Billy Mays was one of the best at what he did. When a company was looking to hire a pitchman, they didn’t look to hire a guy with a beard and a loud voice. They looked to hire Billy. As Seth Godin says, “If you’re the best in the world, the phone rings.” It’s up to you to define what it is you are the best at. It can be to a small and focused audience, but whatever it is you do, you need to stand out and excel. Be the best, and you will always have work. Billy Mays loved to sell, and people loved to buy from him. He went from selling washing machines on the boardwalks of Atlantic City to building a sales empire on nothing but his smile and his unmistakable voice. It’s sad to see him go. I encourage you to check out Discovery’s Pitchmen. It is entertaining, but it also has a lot to say about marketing and the art of selling.